Glasgow Warriors are building momentum towards an "epic" season finale, says full-back Ruaridh Jackson. After being thrashed 56-27 by Saracens in the Champions Cup quarter-final, Warriors have rallied with impressive wins over Ulster and Leinster. Victory over Edinburgh at Scotstoun a week on Saturday would guarantee a home Pro14 semi-final and a shot at reaching May's final at Celtic Park. "It's amazing how quickly we did bounce back," said Jackson. "Getting humbled like that did knock the stuffing out the boys. The atmosphere in the changing room afterwards was really bleak. Everyone was so upset and felt they'd let themselves and the club down. "But the guys didn't let it affect them and came out reinvigorated. We were like, 'right, that can't happen again, we're not going to let that defeat define us'. 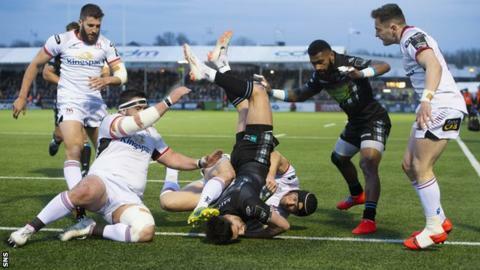 Last season Warriors secured a home semi-final early in the season having dominated their conference, only to be turned over at Scotstoun by Scarlets. Jackson, who has signed a new two-year contract, believes Dave Rennie's men are hitting form at the right time this term. "As long as we keep that momentum up we could have three epic games in Glasgow,'' said the Scotland international. "Last season we probably peaked too soon. This season we've probably had our humblings at the right time. Everyone is right on it in terms of our mentality, training, the focus, everything is geared up for it."